We are selling a unique print from the Minnesota Twins autographed by retired player and coach, Tony Oliva. This full 8 x 10 picture is a print of the artwork by artist, Karl Jaeger and features some of the most celebrated players in Twins history. You are welcome to stop by the library and place your bids to purchase this print. Bids will be taken through this coming Saturday, July 29. Donation amount will be contributed to our Summer Reading Program. 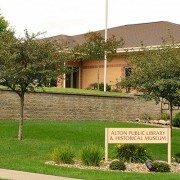 Alton will be having their annual Appreciation Day on Thursday, August 17 from 5:00 – 7:00 pm. 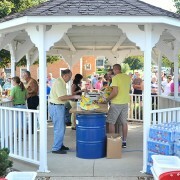 Babcock Brats & Hotdogs, Beans, Chips, and a bottled water. The Fire Department will be doing a Smoke House re-enactment. The NEW City of Alton float will be on display. Drink Specials at both the DD Bar & 10th Street Pub. 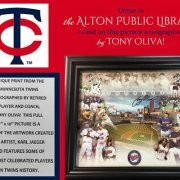 The Alton Public Library is selling a unique print from the Minnesota Twins autographed by retired player and coach, Tony Oliva. This full 8 x 10 picture is a print of the artwork by artist, Karl Jaeger and features some of the most celebrated players in Twins history. You are welcome to stop by the library and place your bids to purchase this print. Bids will be taken through July 29. The donation amount will be contributed to our Summer Reading Program. 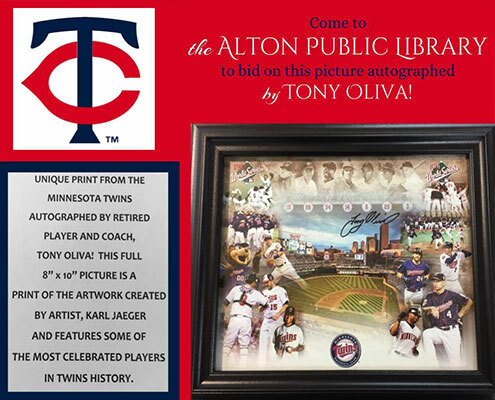 We are selling a unique print from the Minnesota Twins autographed by retired player and coach, Tony Oliva. This full 8 x 10 picture is a print of the artwork by artist, Karl Jaeger and features some of the most celebrated players in Twins history. You are welcome to stop by the library and place your bids to purchase this print. Bids will be taken through July 29. Donation amount will be contributed to our Summer Reading Program. 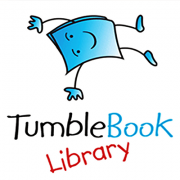 The Alton Public Library subscribes to TumblePremium, “an amalgamation of three collections (TumbleBook Library, TumbleBook Cloud Jr., and TumbleMath) into one easy access point. One super collection, one login. Our username is altonlibrary and our password is libra. Visit our website today and check it out the large selection of online children’s materials! We would like to thank the following businesses for generously donating to our Summer Reading Program! We truly appreciate your dedication to the children in our town and surrounding area! Alton: 10th Street Pub, American State Bank, The Body Works, Casey’s General Store, Community Insurance, Double D Bar, Foreman Tire, Hentges Plumbing, Willett Insurance. Orange City: Don’s Food Center, Dutch Mart, Fareway Stores, Iowa State Bank, Jonny’s Place, Main Street Theatres, Neal Chase, Orange City Health System, Orange City Vet Clinic, Pizza Ranch, Siouxland Travel, Subway, and Taco John’s. Other: All Seasons Center, Culvers, Great Plains Zoo, Henry Doorly Zoo, Kansas City Royals, Kids Gym, McDonalds, Minnesota Baseball, Pizza Hut, Pumpkinland, Wal-Mart of LeMars, Wal-Mart of Sioux Center, Well’s Blue Bunny, and Wild Water West. Come join the fun on Thursday, June 29 from 12:00 – 2:00 pm. Taco in a bag lunch will be served along with games and prizes for the children! Children may continue to read for prizes through July 29. For more information, please go to www.alton.lib.ia.us or check us out on Facebook. 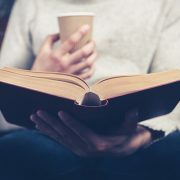 As you go on vacation this summer, remember to check out options for downloading books to your mobile devices. Information on Bridges and Recorded Books can be found on our website. We are selling a unique print from the Minnesota Twins autographed by retired player and coach, Tony Oliva. This full 8 x 10 picture is a print of the artwork by artist, Karl Jaeger and features some of the most celebrated players in Twins history. You are welcome to stop by the library and place your bids to purchase this print. Bids will be taken through July 29. Library News 06/20/17 – Downloadable Books and More! All children in grades K – 5th are welcome to come and attend the programs and read for prizes. Programs will be held on Tuesday and Thursday afternoons at 1:00 pm in the meeting room of the library. Those in 6th, 7th, and 8th grade may pick up their reading logs. For more information, please go to www.alton.lib.ia.us or check us out on Facebook. Come join the fun on Wednesday mornings during the month of June for our Preschool Story Time! All children age 3 – 5 are welcome to come for a time of reading, singing and crafts. Programs will be held at 10:30 am on June 21, and 28. 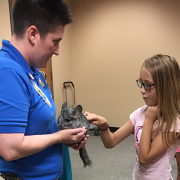 A special SRP program will be held on Tuesday, June 27 at 1:00 pm. Children in grades K – 5th are invited to learn more about healthy snacks and enjoy making some to take home! Come join the fun on Thursday, June 29 from 12:00 – 2:00 pm. A picnic lunch will be served along with games and prizes for the children! Children may continue to read for prizes through July 29. For more information, please go to www.alton.lib.ia.us or check us out on Facebook. 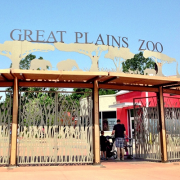 The Great Plains Zoo from Sioux Falls will be presenting a special program on Tuesday, June 20 at 1:00 pm. Be sure to mark your calendar for this exciting event!